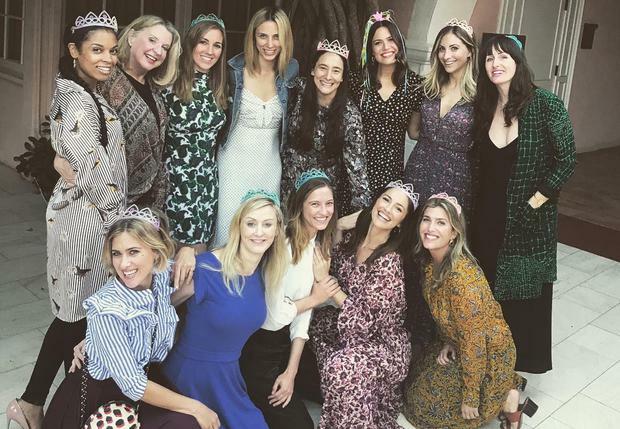 Mandy Moore's adorable engagement party has given us hen party goals after her supportive friends pulled off the ultimate gals night in. The This is Us actor shared several snaps and videos of her friends enjoying games and canapés at the plush Hotel Bel Air. "My heart bursts for each and every one of these ladies," said the bride-to-be in one post. "If you are the company you keep, then I am in excellent standing." The party was hosted by Raina Penchansky and attendees included Mandy's This Is US co-star Susan Kelechi Watson and actress Minka Kelly. My heart bursts for each and every one of these ladies. If you are the company you keep, then I am in excellent standing. Thank you @rp1313 for being the greatest hostess/sister/bff and for giving us all a reason to hang, celebrate and enjoy some delightful gluten-free tea sandwiches (and 🥂) like ladies do. The bride appeared to be well supported by her friends and family, with Minka posting a set of short snippet videos including one where Mandy's mother appeared to be holding back tears as she delivered a speech where she called both the bride and groom 'wonderful people'. Guests played 'Bride Emoji Pictionary' where they had to guess what wedding-related phrase was being said through emojis, and also playe some regular Pictionary, donning their matching sparkly crowns. The girls obviously put lots of effort into the event, and even had personalised bunting hung up with the bride and groom's names. Having declared herself 'not an engagement ring kind of girl', the actress, 33, gave fans a glimpse of her new subtle sparkler on the red carpet at last week's Emmys, where she told fans she was very happy with her new bling. "I'm a bashful girl and I didn't think I really wanted one, but then -- I'm very happy with this." "Because you can see my skin underneath. I like that." Mandy's fiancé Taylor Goldsmith reportedly popped the question at Caffe Luxxe in LA where a source told E! she was laughing, hugging and very cheerful; "It looked like they were celebrating something" they said. Mandy Moore was previously married to singer Ryan Adams and filed for divorce in 2015.